For a casual totaly chic outfit, consider pairing a tan double breasted blazer with black wide leg pants — these two items fit nicely together. Charlotte Russe Qupid Metallic Loafer Mules are a savvy choice to complete the look. If you're after a casual yet chic outfit, wear a grey cowl-neck sweater with a tan suede button skirt. These two pieces are very comfy and look wonderful together. You could perhaps get a little creative when it comes to footwear and lift up your ensemble with Charlotte Russe Qupid Metallic Loafer Mules. If you're looking for a casual yet totaly stylish look, wear a black wool turtleneck with a white shirtdress. Both pieces are super comfortable and look great when worn together. When it comes to shoes, this ensemble pairs nicely with Charlotte Russe silver leather loafers. If you're in search of a casual yet totaly chic getup, pair a black long sleeve blouse with navy skinny jeans. Both items are super comfortable and they will also look great together. When it comes to shoes, this ensemble is round off nicely with silver leather loafers. 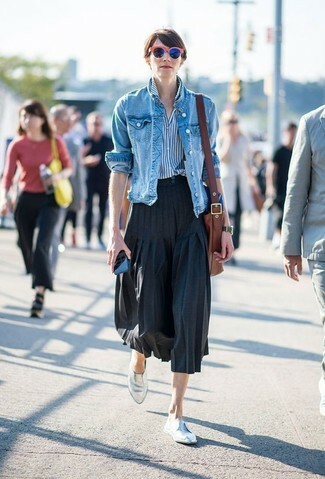 If you're after a casual yet incredibly stylish outfit, pair a blue denim jacket with a black pleated midi skirt. Both of these garments are totally comfortable and look fabulous together. Bump up the cool of your ensemble by complementing it with Charlotte Russe Qupid Metallic Loafer Mules. Marry a white lace off shoulder top with black ripped skinny jeans, if you feel like functionality dressing without looking like a hobo. Amp up the cool of your ensemble by complementing it with Charlotte Russe Qupid Metallic Loafer Mules from Charlotte Russe. If you're looking for a casual yet incredibly chic getup, consider wearing a blue short sleeve sweater and a light blue full skirt. These garments are very comfortable and look fabulous paired together. Sporting a pair of Charlotte Russe Qupid Metallic Loafer Mules from Charlotte Russe is an easy way to add extra flair to your look. 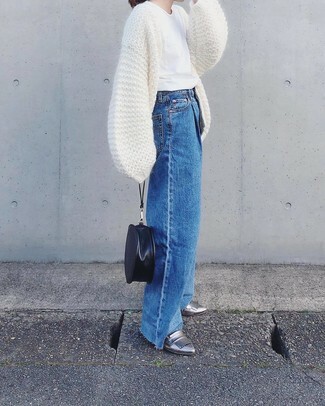 If you're facing a sartorial situation where comfort is a must, this combo of a white knit open cardigan and blue denim wide leg pants is a no-brainer. 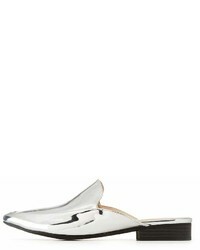 Play up the classiness of your outfit a bit by wearing silver leather loafers. If you're looking for a casual yet absolutely chic outfit, marry a beige fur jacket with black leather leggings. Both items are super comfortable and they will also look great when paired together. Amp up the cool of your getup by complementing it with Charlotte Russe Qupid Metallic Loafer Mules from Charlotte Russe.